We've come a long way from Superfriends, haven't we? What once was a joke of a movie in Entourage has now become a multimillion-dollar worldwide hit. Yes, Aquaman is here, and, based on reactions from audiences and critics alike, Arthur Curry and his finny friends will probably be back in another movie before very long. Like any good movie adapted from a comic book with years and years of history, Aquaman has its fair share of Easter Eggs. 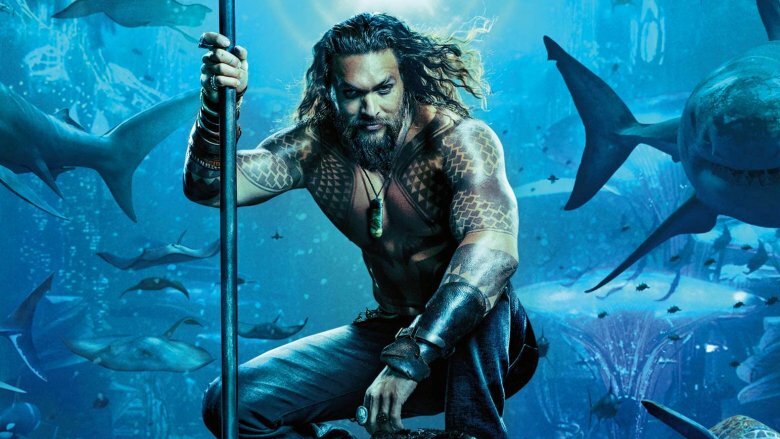 Interestingly, while there are a few nods to Aquaman's comic book past, there are also a handful of non-DC Comics references hidden in the film. Some hidden treasures range from well-hidden cameos to blink-and-you'll-miss-it visuals, while others are pretty deep cuts that only make sense if you've brushed up on your pre-Crisis comic book history. Here are some of the Easter Eggs that you may have missed in Aquaman. And beware: there be salty sea-spoilers ahead. When Atlanna and Tom — Aquaman's Aquamom and Aquadad — meet for the first time, we get a glimpse into some of the ways Tom likes to spend his free time… you know, when he's not rescuing washed-up merwomen from the rocks down near the edge of his lighthouse. 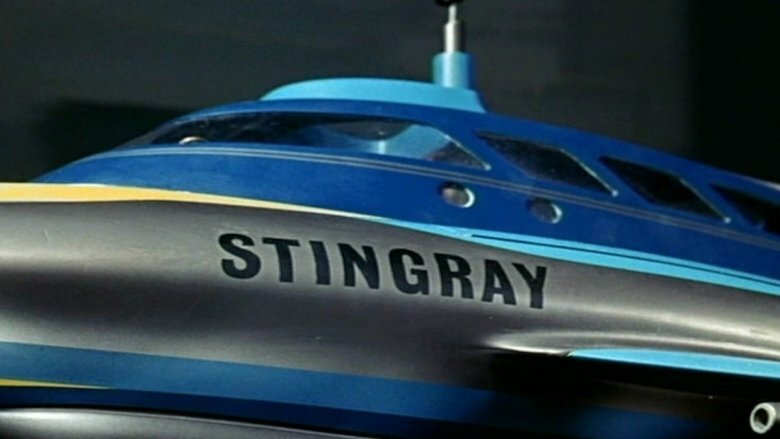 If any moviegoers watched a lot of serial children's TV in the 1960s, they might notice that Tom has an episode of Stingray playing on his television. At least, he does until Atlanna regains consciousness and throws her trident through it. The show, for those who aren't familiar, concerned a heroic submarine crew that discovers civilizations secretly living on the ocean's floor, and the high-adventure hijinks that ensue as a result of that discovery. All things considered, it's a pretty fitting television choice for Tom, if maybe a little on the nose. Meanwhile, fans might also spot a book featuring the works of H.P. Lovecraft on one of Tom's tables. While Lovecraft is known for lots of weird contributions to horror and pop culture, his best-known creation is probably Cthulhu, an ancient type of sea-monster who has a whole bunch of tentacles on his octopus-face. The various civilizations we see throughout Aquaman — as well as the secret ocean in the center of the world and particularly the sea-monster Karathen who guards Atlan's trident — all seem to be at least partially inspired by Cthulhu and the rest of Lovecraft's creepy writing. While Aquaman director James Wan may not necessarily be a household name just yet, fans of horror movies are extremely familiar with his work. Wan became well known for his work on the Conjuring movies, which feature a pair of paranormal investigators who, well, go and investigate the paranormal. 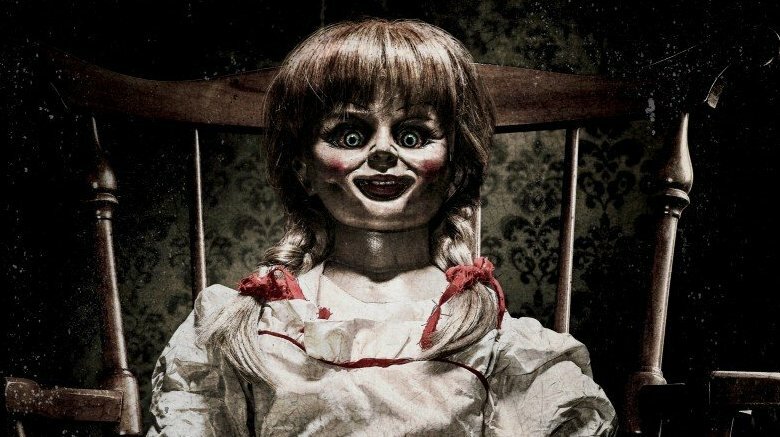 And one of those creepy supernatural things is the Annabelle doll, which viewers can spot sitting near Mera's ship shortly after she brings Arthur down to the ocean to begin their adventure. And that's not the only reference back to the Conjuring series. Patrick Wilson, who plays King Orm, has appeared in both Conjuring films as Ed Warren, a character based on a real-life ghost-chaser whose files give the movie franchise its inspiration. And, while we're on the subject of Patrick Wilson, this isn't even the first time he's appeared in a Warner Bros. superhero movie. Back in 2009, he appeared as Nite Owl in Zack Snyder's Watchmen adaptation. The Conjuring isn't the only horror franchise for which Aquaman director James Wan is known. The other one — the one that provided him with his big break in Hollywood — is Saw. Wan directed the original Saw short, as well as the first film in the series. So, if thoughts of Jigsaw's elaborate death traps keep you up late at night, you have Wan to thank. 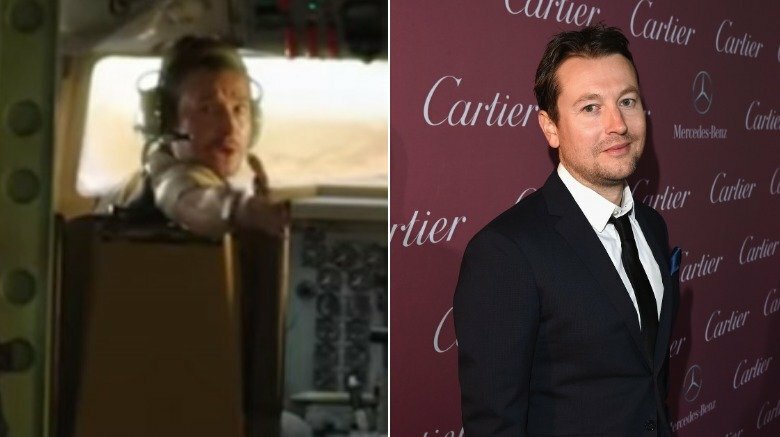 Well, him and the guy who wrote the original movie: Leigh Whannell. Why are we bringing up Whannell? Well, it's because the Saw screenwriter happens to be the guy flying the plane during the scene where Mera and Arthur go skydiving without parachutes. Clearly, Wan wanted to make sure his fans knew he wasn't turning his back on his filmmaking past. That scene also also featured yet another hidden reference to Wan's previous cinematic work — namely, his directorial duties on 2015's Furious 7 — though it's more of a conceptual Easter Egg than anything. Pitbull's "Ocean to Ocean," which samples Toto's "Africa," plays as Aquaman and Mera fly over the Sahara desert. Wan told Digital Spy it's "almost like my little tribute to my Fast & Furious background." It's no secret that tons of movies and TV shows try to make themselves seem more believable by enlisting the help of real-world media personalities to talk about the fictional events or characters you're watching. You know the moments — like when Anderson Cooper appeared on CNN to cover the big superhero throwdown in Batman v Superman: Dawn of Justice. But Aquaman goes in a different direction. Just as folks in the DCEU read the Daily Planet rather than The New York Times, they also watch channels other than, say, MSNBC. 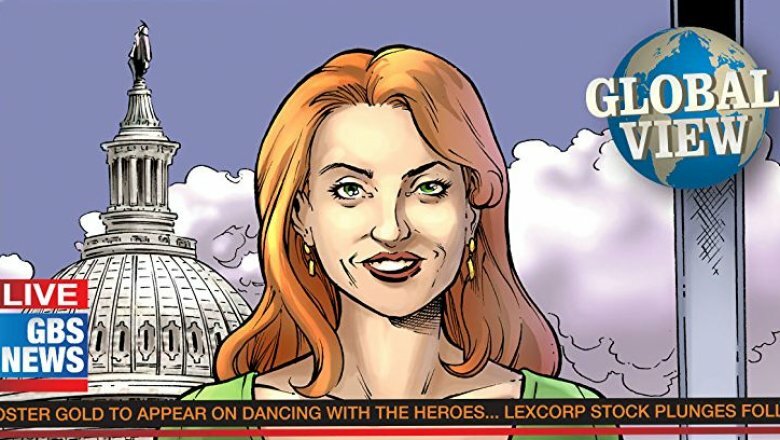 When the characters in Aquaman flip on the news, the anchors sit behind the desk at GBS, a fictional network pulled straight from the pages of DC Comics. Longtime readers might know that in 1971's Superman #233, Clark Kent gave TV a shot, working as a news anchor for WGBS. Meanwhile, Randall Park makes a couple appearances on GBS in Aquaman as Dr. Stephen Shin, a relatively minor character from the comics who eventually came into conflict with Aquaman when the hero wouldn't reveal the secret location of Atlantis. Chances seem good Shin's role will be expanded quite a bit in the eventual sequel. Pretty much all of DC Comics' superheroes have their own fictional locales where they hang their capes, and Aquaman's no different. The battle for Atlantis' throne is one of the film's central plotlines. However, while we have no shortage of undersea civilizations to see as the movie progresses, another scene seems to lay the foundation for a different superhero who we haven't actually met in this version of the DC Extended Universe. During the one and only post-credits scene, Black Manta and Doctor Shin talk to each other in Shin's hideout. That's where we see a clipping from a newspaper speculating about the identity of Aquaman — and the newspaper itself is the Coast City Gazette, the hometown paper for another important DC superhero, Green Lantern. 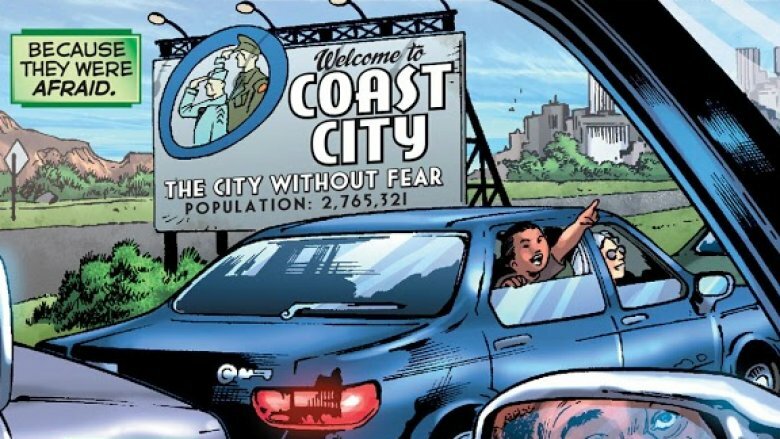 Sure, if you saw the Ryan Reynolds-starring Green Lantern movie from 2011, you're probably already familiar with Coast City… but there's actually a pretty good chance you didn't see it, since it didn't sell enough tickets to justify a sequel. Green Lantern's become a bit of a punchline since it flopped, forcing Warner Bros. to basically reboot their cinematic universe ambitions with Man of Steel in 2013. Since then, we've been introduced to tons of heroes and villains, but except for a small cameo during a flashback scene in Justice League, the Green Lantern Corps remain MIA from this incarnation of DC's movieverse. Could this small newspaper clipping lay the groundwork for Green Lantern's impending return? Most DC Comics fans know that Aquaman has a sidekick who usually goes by the name Aqualad. But even though Aqualad has had comic book and animated adventures of his own in the Teen Titans and the team from Young Justice, Aquaman has yet another sidekick who rarely gets the respect he deserves. 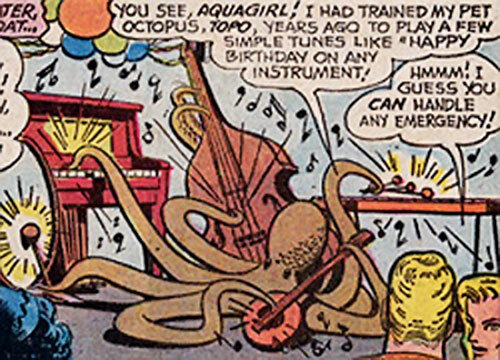 That's right, we're talking about Topo the octopus, an eight-armed sentinel of justice who Aquaman taught to play several instruments at once… mostly so he could play "Happy Birthday" should the need arise. No, really. 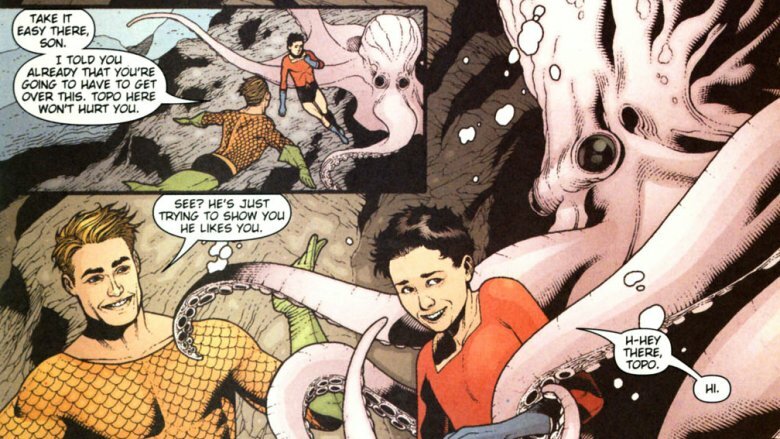 As silly as the Aquaman movie turned out to be, James Wan and his crew wisely decided not to go so far as to have Arthur hang out with his octopus pal. However, Wan has, indeed, confirmed that Topo makes an appearance in the movie anyway. He's not easy to miss: he's the giant octopus playing the drums during the Ring of Fire battle scene between Arthur and King Orm. 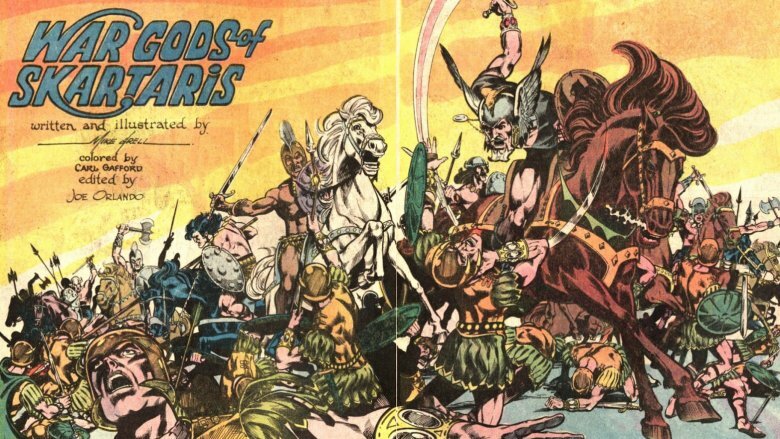 In the mid-1970s, DC Comics published a series called Warlord, about an Air Force pilot who crash lands in a place called Skartaris, a lush jungle land filled with fantastic creatures and dinosaurs. In the third act of the movie, Aquaman and Mera find themselves in a mysterious land in the center of the Earth, filled with lush jungle and dinosaurs, where they're reunited with Atlanna, who's been there by herself for 20 years. While Skartaris in the comics does, in fact, feature various factions of people, Atlanna says she has been alone the entire time she's been there. That might mean that wherever she's been is not actually Skartaris, or simply that she never managed to encounter any of the land's inhabitants. Maybe Warner Bros. will announce a Warlord adaptation coming to the big screen any day now. But until they do, this Easter Egg might not be as fresh as the others.